Campus Advantage has performed due diligence consulting on over 75 properties and manage each engagement with a two-fold approach to help investors assess an acquisition’s potential. Verifying an asset’s physical condition and financial performance is an imperative step of the due diligence consultant’s process; however, evaluating where an asset fits within the marketplace is also crucial to determining the success of an investment strategy. It is imperative to measure how a property’s current physical condition, reputation, and price point have historically driven performance, and how a property will perform in the coming years with improvements and foreseeable marketplace changes. A due diligence consultant should not consider the due diligence complete without a thorough analysis of enrollment trends, competitors’ leasing strategies, supply/demand metrics, and foreseeable marketplace changes, as these factors could drastically impact the feasibility of an investor’s business plan. Where does the property currently fit within the marketplace? The first step of this process is determining where the property currently fits within the marketplace. Is the property the off-campus housing choice for price-conscious students, or does it serve the affluent demographic? Do students choose to live at the property for the social atmosphere, or do their parents steer them to the community for its safety features and quiet reputation? The property’s position can be evaluated by comparing standardized rental rates against the competitors to gauge how the property’s current rates fit within the market. Intercept surveys with residents, staff, and prospective students can provide anecdotal feedback about the property’s reputation and target demographic. Pre-leasing trends can also uncover how the current resident base reacts to rates and preferable floor plans. For instance, if the lowest priced floor plan leased up quickly, it may be an indicator that students with lower financial means opt to live at the community. Alternatively, if the property pre-leased ahead of the market, it may be a sign that the community is highly sought after, and rental rates could be increased based on the positive reputation and amenity offerings. What is the business strategy for rates, utility inclusions, and capital improvements? Understanding the property’s current position in the market allows an investor to gauge which capital improvements to invest in based on how rental rates can be maximized. Once the standardized rental rates have been compiled for the market, analyze the property’s closest competitors in terms of price, location, and amenities. If the acquisition is a value-add investment, find a competitor with a similar location and more luxurious amenity offerings to compare rental rates increases too. In order to gauge the depth of the market for another property at this price point, evaluate how the market has responded to this competitor by analyzing their pre-leasing velocity, year-over-year rental rate growth, and historical occupancy. If the acquisition is a core or core+ investment, evaluate the depth of the market at the higher price point. Diligently research whether the higher-priced sub-market leases quickly with frequent rate increases or is forced to offer concessions and drop rates, as these are indicators of whether this price point is sustainable for the foreseeable future. How will the property remain competitive with potential new supply? Potential new supply must be evaluated as part of every due diligence as additional developments could create supply/demand risks, cause more students to live on campus, or drastically impact rent growth opportunities if the properties are not appropriately priced. New supply is often viewed as a negative for most markets; however, new supply can also help increase a market’s overall price point and allow the higher priced properties to further push rates or enable the price conscious properties to attract more renters. Evaluate what the new supply is offering for unit and common area amenities, floor plans, and rental rate inclusions to help drive the capital improvement strategy. If the newer supply is including granite countertops and stainless steel appliances, renovating unit interiors with faux granite and black appliances may not be a viable option if students are drawn to a more modern look. Alternatively, if the new developments will feature mostly one- and two- bedrooms in their unit mixes, the investor should focus on growing rents more aggressively in the three-and four-bedroom units since these floor plans will be supply constrained. Do the foreseeable marketplace changes offer an upside for the investment or create risk? 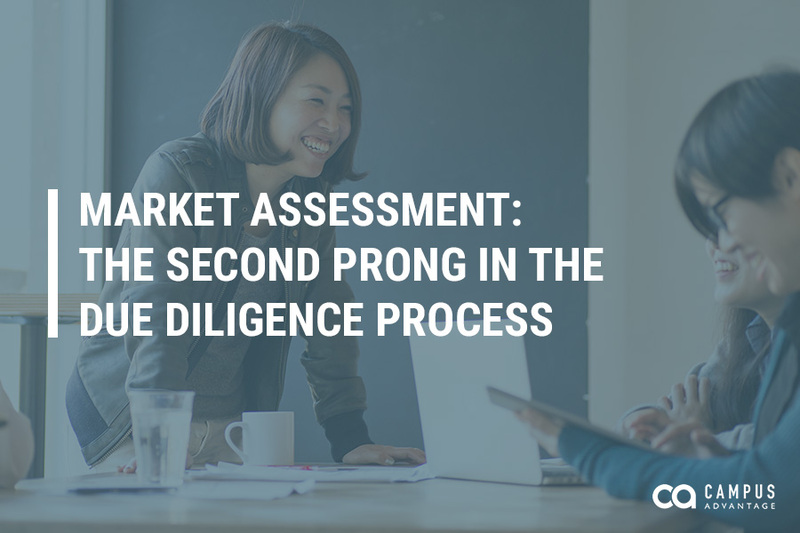 Enrollment trends, competitors’ leasing strategies, and the university’s strategic plan could all either enable an investment to thrive or greatly hinder future success, therefore marketplace changes should also be studied as part of the due diligence process. Speaking with the university and researching their strategic plans will uncover details pertaining to how the school plans to grow enrollment, whether through expanding their campus to allow for more students or extending their remote infrastructure to support online growth; two scenarios that will return very different results for a market’s demand. Diving into how the university plans to grow enrollment or their assumptions for new on-campus housing and future live-on requirements will help flesh out future demand projections. The competing properties should also be evaluated to determine if they are preparing to undergo similar capital improvement plans, are requesting approval to build additional beds, or preparing to change ownership, all which could signal a change in their rental rate structure. Marketplace changes often create an upside for investments, but deviations can also generate lease-up risks that will need to be carefully weighed before waiving due diligence. Assessing the market and future trends should always be the second prong in the due diligence process, as following a two-fold due diligence assessment will confirm the integrity of the financials and asset’s condition but also reveal market nuances and potential risks that were not initially contemplated during underwriting.